With an economy that’s supported mostly by tourism, the locals know how important tourism is and thrive on it. You’ll meet some of the friendliest people in the world in the Maldives and they pride themselves on offering incredible service. English is commonly spoken and taught in schools, which does make it easier to communicate and ensures you will be able to have an easy, hassle free trip. There’s nothing worse than having communication break down issues while you’re away on holiday thousands of miles away from home. Warm smiles and homely service will become just another reason you’ll second guess leaving this beautiful island paradise! 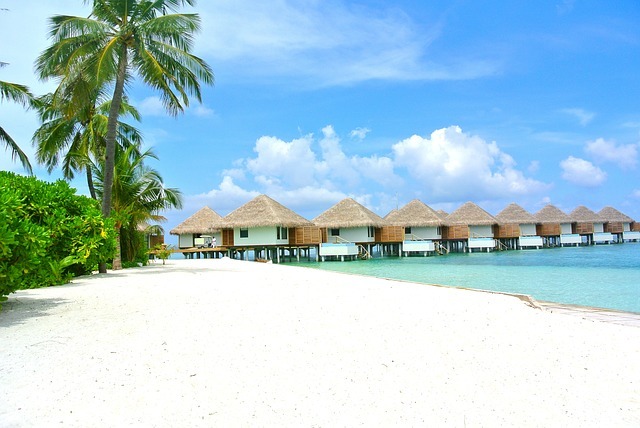 The calibre of accomodation available in the Maldives is truly some of the best in the world. Whether your traveling on your honeymoon, as a family looking for a larger bungalow, as a group of friends or even on an anniversary trip, there are so many different types of accommodation you will be able to find something in your price point. However if you’re like me and craving something of a higher standard, you will be spoiled for options. Head to www.neoscapesmaldives.com to start browsing some excellent accomodation options across a wide range of price points. Fancy a private bungalow over the water? You’ll be able to find one. if you want to grab yourself a bargain, check out their early bird deals. While I love any beach and feel so much better being close to the ocean, my favourite type of beach is one with white sand. I just find the bright white sand contrasts the blue ocean so much better and makes for incredible photos. The sand in the Maldives is so bright, it almost doesn’t even seem real. Often regarded as some of the best beaches in the world, one of my favourite things about the beaches, is depending on the hotel or resort you choose, they’re often super private too. Usually you just share the beach with the other guests. This means if you choose a smaller hotel or resort, you’ll have a lot more privacy at the beach. There’s nothing quite like that feeling of having a beach to yourself, so if you can choose a hotel that’s smaller, I would definitely suggest it, even if it’s just for a few nights before changing to a larger resort for a different experience. Are you a fan of water-sports? Personally I love diving and try to get in as many dives as possible whenever I’m near the ocean. The Maldives is known to be a hot spot for diving because the coral is so well preserved and there are a great diversity of marine life, ensuring that you are going to see a great variety of beautiful species. If you haven’t dived before, don’t worry there are plenty of great schools to learn through. If you want to do something a little more relaxing, the Maldives is also a wonderful place to go snorkelling, whether you want to snorkel just in front of your hotel or resort or you want to take a more adventurous boat trip out to a more diverse area. Your hotel should be able to book boat trips for you, just be sure to check in advance what options are available! If you’re planning to do a lot of snorkelling in the Maldives, renting them can quite expensive. One type I have is that because they’re quite inexpensive to buy off Amazon, it can actually be better to buy your own snorkel masks and take them along with you and the best part is that you can take them along with you on any other tropical vacations. If your idea of the perfect holiday involves sunshine, being by the ocean at all times, incredible beaches, fun beach activities such as snorkelling, diving, paddle boarding, reading books in hammocks, and disconnecting from the normal 9-5 then this could be a wonderful holiday for you. When I’m away from home, taking a break from work, I like to forget about all the responsibilities back home. While having Wifi and being able to be connected with loved back home is such a blessing, I think it’s really important to take time to disconnect and focus on what’s really important: those we’re with in the moment. The slow, relaxing pace of the Maldives will force you to slow down and soak it all in. Which is definitely a good thing because there’s so much beauty you will want to enjoy it all. Chances are you’ve travelled a good distance to be in the Maldives so please don’t make the mistake of spending the whole time of your phone or laptop working! Use it as a chance to really relax, detox and soak in your beautiful surroundings. Because there are so many wonderful places to stay, the weather is wonderful and warm year round and the quality of service is almost unbeatable, the Maldives is the perfect recipe for a romantic holiday destination. This makes it an excellent holiday destination for honeymoons – there’s probably no better destination in the world to take your new husband or wife to spend a relaxing honeymoon together. Whether you want to do some fun water sport activities together, enjoy some incredible spa treatments together, or simply spend far too long indulging in the incredible facilities your hotel room has – it’s your holiday to do whatever you want to do! But of course your honeymoon isn’t the only time when your partner deserves a romantic holiday, why not plan a trip to the Maldives for your next anniversary? Every year my partner and I take turns planning surprise trips for each other – it’s such a fun way to inject a little mystery and excitement back into our relationship. You could implement that in your relationship and start by planning a trip to the stunning Maldives!